The Ogunquit Playhouse and the Music Hall in Portsmouth, NH. I am amazed sometimes when I realize that these two gems of American theater are within a 15 minute drive from the center of my town! Both of these centers for the arts immeasurably enrich this area, bringing superb live theater, opera, film festivals, famous authors and so much more to residents and vacationers alike, with many performances specifically for families with children. If you're looking for Art Gallery information, please see the link near the bottom of this page. 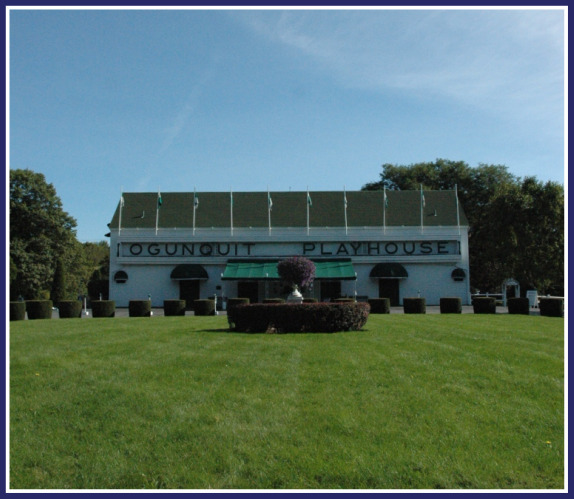 Now under the stewardship of The Ogunquit Playhouse Foundation, a not-for-profit organization whose mission is to “preserve and maintain the Ogunquit Playhouse as a community-based performing-arts center”, the Ogunquit Playhouse continues to earn its' reputation as “America's Foremost Summer Theater”. Since 2006, visitation at the Ogunquit Playhouse has more than doubled and the demand enabled the theatre to expand its season from the traditional 10 weeks to a 21-week season. For the first time in its history the Playhouse has been opening its doors to enthusiastic crowds in May and extending the season into the fall, so those who travel to Maine in autumn now have an opportunity to see self-produced, professional theatre. Personally, I love the fact that the ticket prices at the Playhouse are nothing like they are in Boston or New York – even the parking is free! And as a professional (Equity) theatre, the Playhouse is able to present the best talent from Broadway, television and film in their shows. I have received the gift of tickets to a Playhouse show for my birthday, and I've also given the gift of Playhouse tickets. It makes a particularly good gift for older people who tell you that they don't want “stuff” anymore (yes, you, Mom!). But take them to dinner and a show at the Ogunquit Playhouse, and it'll be a cherished memory for both of you for years to come. Whether you're looking for a unique gift idea, or a you're a couple or family on vacation, seeing a show at the Ogunquit Playhouse will be a truly one-of-a-kind experience: and you'll be taking part in one of the longest-running traditions of American summer theater. The Music Hall in Portsmouth, New Hampshire is a non-profit like the Ogunquit Playhouse but unlike the Playhouse, the Music Hall is open year round. Its historic 900-seat theater, built in 1878, is the oldest in New Hampshire and has been designated an “American Treasure” by the U.S. Senate. The historic hall is located in Portsmouth, the seaport city recently named a “Distinctive Destination” for 2008 by National Trust for Historic Preservation and one of the “20 Best Towns in America” by Outside magazine (July 2008). In recent years the theater has welcomed such bright stars as Wynton Marsalis, Alan Alda, Patti LuPone, John Updike and Crosby & Nash. Grammy, Tony and Pulitzer Prize winners have graced the stage in performances unique to the region. And The Music Hall is drop-dead gorgeous, as an American Treasure should be. I don't think the pictures really do it justice, but go ahead and take a look. The recent renovation of The Music Hall lobby is nothing less than spectacular, and if I were hosting an event (rehearsal dinner, perhaps?) the Beaux Arts lobby at The Music Hall would be at or near the top of the list as a venue. One of the reasons that I love The Music Hall, besides its' sheer beauty, is that they routinely show classic movies that should be seen, at least once, on the big screen. I took my oldest child to her first movie there, and it was The Wizard of Oz. You ain't seen that green-faced Wicked Witch until you've seen that green face filling the BIG screen! In addition to live opera performances from The Met in New York shown on the big screen in high definition, The Music Hall hosts film festivals, magic shows, Christmas concerts, ballets, and much more throughout the year. ...the tour paints a full picture of the history of the hall, including the tales of sailors who rigged the theater in the late 19th Century, its flashy and famous owners, and stars who have taken stage, from Buffalo Bill to Paul Newman, Pearl Bailey to Alan Alda, John Philip Sousa to Wynton Marsalis. Now that would make a terrific vacation activity, no? Click on this link for a complete list of Southern Maine art galleries. Seacoast Repertory Theater: 125 Bow Street, Portsmouth, NH. Locally and regionally, people plan their summers around productions and travel to the Seacoast to experience performances at Seacoast Rep. In the winter year-round subscribers engage in a dialogue around compelling and high quality work including packed pre-show symposiums and post-show discussions. The Senior Moments program provides the community's seniors the artistic platform to create new work of and about their generation. FMI: www.seacoastrep.org. Prescott Park Arts Festival: Prescott Park, Portsmouth, NH. Located on 3.5 acres in beautiful downtown Portsmouth, the arts festival has a long and rich history of successfully presenting the arts with no fixed admission. Because of this policy, many people have their first experience with a live performance at Prescott Park. FMI: www.prescottpark.org. Merrill Auditorium: 20 Myrtle Street, Portland, ME. The Merrill is easy to get to from York, and Portland is one of the finest small cities in New England. A vacation day is well-spent exploring this beautiful area and taking in a show. This auditorium is home to the Portland Symphony Orchestra and home to the Kotzschmar Organ, one of the largest municipal organs in the world. Click on the video below to listen to the Kotzschmar Organ being played – the video also has some good views of the interior of the beautiful Merrill Auditorium.